« Why Is Wal-Mart Selling X-Rated iPods? Netflix and LG Electronics are reported to be prepping a Apple TV killer, a set top box that will let users stream video content from the Internet directly to HDTVs. Netflix has 7 million members. If it can convince even a small percent of its members to try the service, it could quickly leapfrog Apple’s Internet television device. “This could shape up to be a boxing match between Apple and Netflix over video streaming content to TVs and PCs,” says Michael Olson, an analyst at Piper Jaffray. According to Olson, Netflix’s set-top box needs to cost about $100, with a monthly subscription rate of $12 for rentals of two to three titles at a time, in order to succeed. “The potential is huge over the next 10 years,” as millions of Americans buy HDTVs and increasingly pipe Internet content straight to them, says Netflix CEO Reed Hastings. 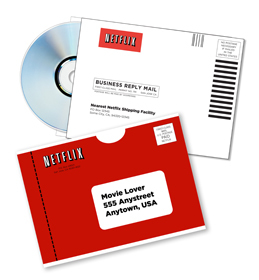 Netflix is the leader in DVD-by-mail rentals, but has to adapt to the growing interest in Internet video. There’s no word if Netflix’s solution will support video podcasts or other Internet videos. If somebody wants this sort of box, it’s available right now and it’s called the Vudu. Go to Vudu.com and read about it. The difference is you pay for the Vudu up front and then theirs no monthly rental fee. You just pay for movies when you want to watch them. It has HD content (limited now, but more coming soon) as well as TV shows and over 5000 movies. The SD videos look better than their DVD counterparts, but they don’t come with any of the extras you get on a DVD. The HD content looks better than anything I’ve watched on my DISH HD system. It’s certainly worth a look if you’re interested in having a video store in a box – and it totally blows AppleTV away. Thanks for the feedback. Does the Vudu support video podcasts or other free Internet contnent now?